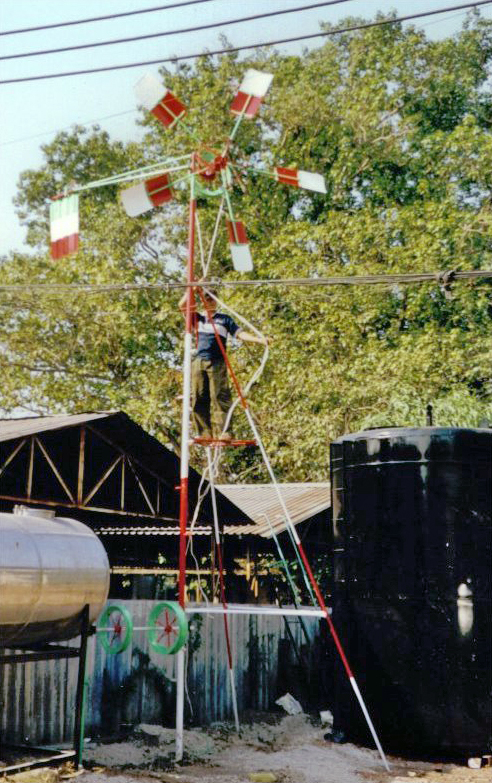 The wind Rope pump combines the hand Rope pump with a windmill, partly based on the modern Dutch CWD 2000*** wind pump model. There are 2 types of Wind Rope pumps. The 270 model functions with winds changing within 270 degrees (seasonal winds). The 360 model functions in all wind directions, this model is still being improved. Low starting wind speed 3 - 3.5 m/s (no initial water column). Simple rotor, head and tower construction. Can be produced with basic skills and standard materials. Total weight 80-160 kg (1/3 of that of a traditional wind pump). Option to mount a US$ 50 charger for battery charging. Backup system by hand or a motor (in case there is no wind). 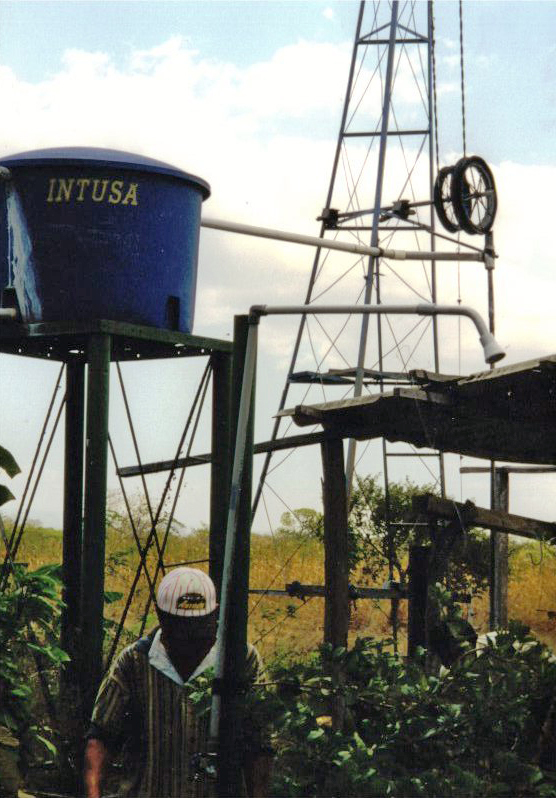 The user can do maintenance and most repairs (proven in Nicaragua). Costs 3 to 4 times less than traditional wind pumps. 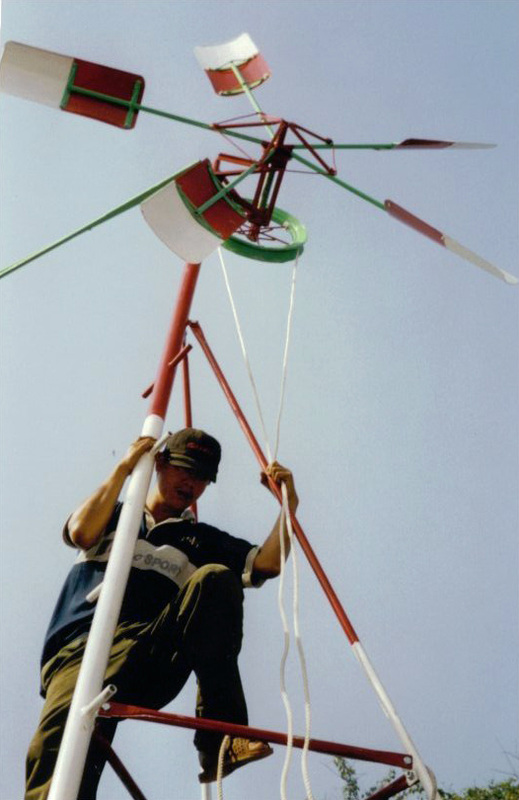 ** For evaluation and articles on windpumps see arrakis.nl (Jan de Jongh's report). 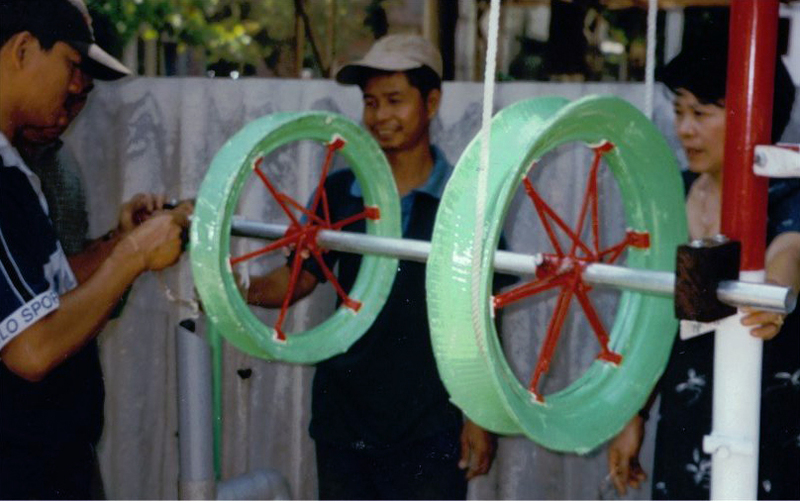 The workshop AMEC also produces a small wind generator for battery charging. It uses the same safety system and construction details as the wind Rope pump. It has a slow running 3 bladed rotor which drives a 100 Watt permanent magnet generator. With wind speeds of 4 m/s it can supply enough energy for 3 light bulbs and a television. It can be produced with basic tools and standard materials.